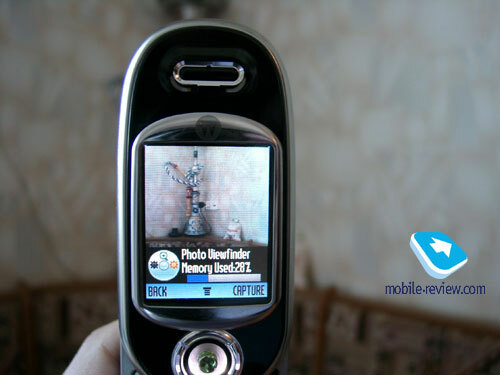 We’d like to review characteristic features for Motorola v80, we will not speak about the phone’s functions since they are similar to Motorola v500, v600. If you need to know more about the features – please read it in order to understand the phone’s functionality. 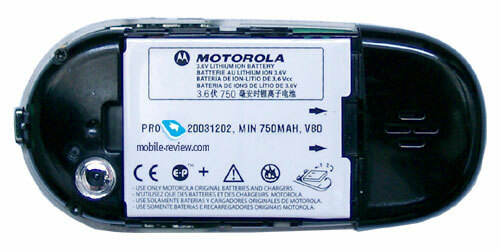 V80 is the successor for such model as Motorola v70. By the way the manufacturer decided to change the title, R880 is now known as v80 in order to point out the succession of these models, an interesting case, considering that the company is still sticking to new title scheme for other upcoming models. 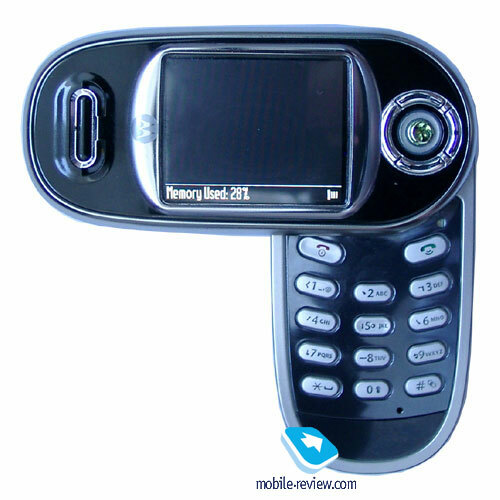 Motorola v70 was popular due original mechanism of opening, but when the price has started to fall - its popularity was decreasing as well. Fashion phone users prefer having a unique, expensive phone in order to show their status. In case with Motorola v70 low price was pushing away new consumers, for a short moment the phone became mass and after that it disappeared from the market. 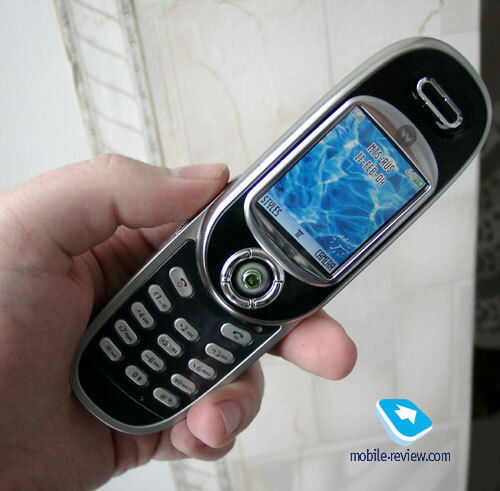 A lot of time had passed since Motorola v80 was introduced, the company was seriously preparing for another fashion phone release, Motorola was thinking about its promotion strategy. The two main conclusions that were made are simple and obvious. First of all, the phone must have maximum functionality and justify its price as technical device. Additional extra charge for the fashion device status is taken not only for brand and unusual mechanism, but the quality of materials being used, unique fashion functions (haptics). Second, the company made a strict decision that a phone of such segment can’t become cheaper with time, this means that Motorola v80’s price will remain on the same level through its life cycle. I’d dare to suppose that if second conclusion will be maintained the phone will be around the market for two years. If the price will start decreasing, then the phone will not stay around more than for one year. Let’s get back to the phone’s functionality, shall we? The first thing that gets marked out by company’s representatives is two modes of picture displaying on the phone’s screen. In standard mode, the vertical one, everything is common since all of us are used to such mode. In landscape mode you rotate your screen by 90 degrees and get the ability to take pictures at once, the camera turns on automatically. NB! The resolution of VGA camera is 640x480 pixels when the display is in vertical position you will get the picture with 480x640 pixels instead (if it is made by software like that), either you are forced to see the picture scaled down to screen’s size. 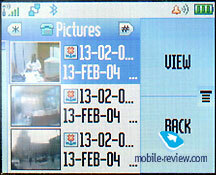 In case with Motorola v80 the user sees picture in full screen mode right in the picture taking mode. When you view taken pictures, you can view the standard mode (vertical orientation), or rotate the screen and view pictures in full screen mode. In my opinion saying that this is a technological breakthrough is not pretty right, it is just another additional features that gives the user more freedom. But by summing up such small improvements we get a good working and convenient product. 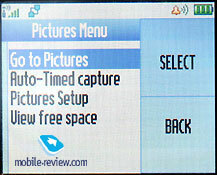 In the mode when the screen is rotated camera and picture viewing modes are the only features that work, main menu and other features are not available. Seems that redesigning whole interface would have required too many efforts, this would have not been justified. In picture taking mode you have to get used to the phone, since when you are holding the phone in your right hand, the camera often gets shot by it. After few days you will be able to work out a definite style, the way how to hold your phone properly in order to not create any troubles when the picture shooting process is under way. An interesting moment is related to the fact that mechanism can work only in one direction, left and up. In previous model you had the ability to rotate upper part the way you wanted. This limits left-handed people’s possibilities at once, since such phone usage will not be convenient for them. Although I believe that left-handed people will be able to get used for this mode, but this will require certain amount of time. Opening mechanism features auto-completion function, just slightly move the phone’s upper part and it will shot up in the air, the phone will open. You are free to bind various sounds for opening action then you will attract the attention of passers by. It is all up to you to decide weather you need this attention or no. On the whole the mechanism does not bring any inconvenience; everything works clearly without problems. You can enable optional animation for opening process, and then you will see the picture’s rotation process being emulated. An interesting fashion feature, that doesn’t bring any value. 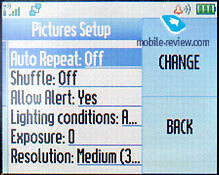 You can return to camera mode only when the phone is fully opened, otherwise the phone is not fixed in that position. For opened phone, as well as for closed position various wallpapers can be setup, this is convenient. Mechanical reliability of such construction is high, there is a slight hole between two sides, but its presence is caused by the auto opening mechanism, the phone would have been unable to automatically open without that. Materials used for the phone’s construction underline its status, glossy plastic, metal substrate when the phone is open located on the back side. These are the factors that single this model out from its predecessor, who had been showing plastic on the back side, when the phone was opened, such factor was not playing a good role for the phone’s attractiveness; it just looked rather cheap. A typical disadvantage for glossy surface is the fact that it collects handprints, which is not so obvious like in other products, but is still noticeable. The phone’s size as well as its weight is comfortable, no difficulties were caused by any of these factors. A lot of people noticed that the phone is actually smaller, than it might look on the pictures or under the glass. You have to take the phone into your hands, in order to truly feel it. Sometimes the phone might open while being carried in ones pocket, but this is something which can’t be overridden. I can’t say that such occasions happen quite often, I’ve been using this phone for one month, and such accidental openings occurred about 3-4 times. You can’t answer incoming calls when the phone is in closed mode. When the phone is opened, you will notice that the speaker has exists on both sides. Constructors decided to use a special placement of speaker’s holes in order to make good quality of voice playback; they also managed to achieve small width of upper part, as well as keeping the phone’s specifications untouched. You can see the hole of additional speaker on the lower (back) part of the phone - it is made for ring tone playback. A good set of features was achieved thanks to this separate speaker construction. This phone features 24-tone polyphonic ring tone, its volume is pretty loud and can be compared with other v-series models, but is weaker than those that are installed in Korean phones. I’d like to notice that any mp3 files can be used for ring tones; they can be uploaded via Bluetooth-connection or data-cable. 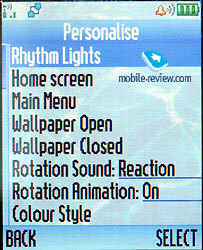 Some words about the screen, it can display 65000 colors, which is fully similar to Motorola v500, v600. This is one of the best screens on the today’s market, and can be counted as being fully competitive with similar screens from Samsung, although it is still a bit weaker, but not much. Since we are describing only peculiarities in this review, I’d like to forward you to Motorola v300, v500, v600 review for additional information. The lid which covers battery section can be removed without much effort being involved; it is made of plastic However it is rather hard to place it back, some time must be spent before you will get used to this process. Small backlash can be noticed after one month of the phone’s usage that featured several falls. This backlash can be considered as minimal, and it doesn’t really affect the phone’s working process. The battery is LiIon of 750mAh capacity. With normal, active use of this phone (40 minutes for talks, up to 20 minutes for other function usage, 10 minutes for external backlight work on the phone’s sides) it works for about 2 days. This is normal and pretty acceptable rate for such phone class. 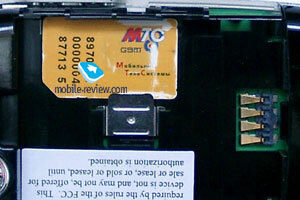 SIM-card holder is typical; it doesn’t cause any difficulties. Joined volume regulator button is located on left side; soft-key that is responsible for access to dictating machine or other voice functions is located on the right. Handsfree garniture connector is located there as well. Sliding holder for placing the strap is located on the phone’s top. You can read SMS messages, view call list when the phone is closed. Everything is pretty simple. After opening the phone you will notice the keyboard, which is made of plastic. The key size is average, they are nicely placed. Backlight’s color is white, the symbols are clearly seen, but not in all conditions. Work with keypad can be classified as convenient, no problems were noticed. The fact that joystick and other soft-keys are located on another level, a feeling of discomfort can be caused sometimes, when certain operations are under way. The joystick is tight enough, and reacts for pressings. You have to get used to it, usually it takes few days, and after that you will not notice any problems again. 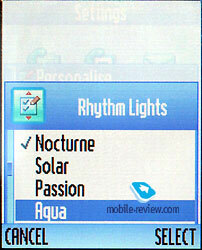 The main function that can be stated as being revolutionary for fashion phones is rhythm and light (haptics). Haptics was first introduced in Е380, which was presented on last year’s CeBIT. It did not cause any special agiotage, especially since there were really few samples of new products on that exhibition. Later on this function was added to other models, but its logical development was achieved only in v80. 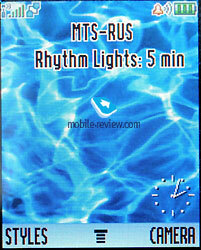 We will describe it more detailed in the review of Motorola v80 that will be published this week. So far – only short quotes. Any occasion can be assigned with light indication. The whole phone’s edging is gloving, its color is silver, but the backlight can have any color you like. Small lights pour through whole edging, and run in tact to the music. The effects variety is rather large. If you open the phone, keyboard will be glowing as well, besides edging. The phone has several color schemes, and the user can choose the one he likes most. Haptics is fully fashion function, but it does its task pretty well, those who had seen v80 ringing will never forget it. Second usage of such function is obvious as well, but uncommon for a phone on the whole. Developers turned the phone into modern accessory. When you hang it on your neck, you are free to activate rhythmical backlight function (certain time terms, rather long ones up to 10 minutes. In this mode the phone will be blinking with various colors in tact with the music. V80 turns out to be some sort of personal light-o-music machine. There was a party in Krakow, where Kevin Mitchell was playing the role of walking advertisement of v80 being a stylish accessory. You could have noticed him easily among the crowd - his phone was definitely the attracting factor. I believe that this is the first fashion phone that became so fashion, pure fashion to say it otherwise. The functionality remains on maximal level for today, all functions are at top notch. 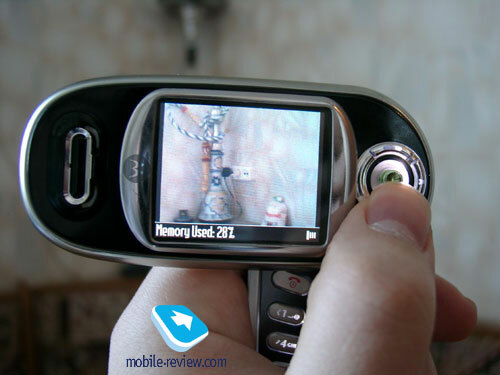 We will not describe the rest of Motorola v80’s functions; they are similar to those that are presented in Motorola v600, in case you are interested – go read the very detailed review. . 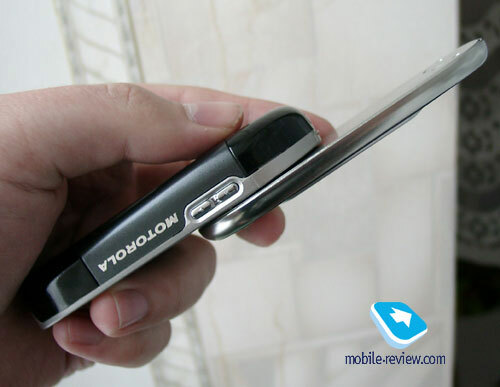 Here we were describing the differences of this model from the already presented Motorola v600. The new form-factor affected the handsfree mode; its volume is now lower, than in other v-series models. The usage of such features is possible only with low noise level, otherwise using it becomes impossible. My sample, which is not actually commercial one, some software problems were noticed. The manufacturer claims that they will be fixed before retail samples will hit the shelves. I actually believe that this is the truth, since Motorola v600 doesn’t have any obvious bugs. Completely local problem is when you open the phone very fast, or hold it when its opening the picture turns out flipped periodically. This is sort of curious as well, and can be fixed with another close-and-open process. This was promised to get fixed as well, we shall see in spring if this actually happen or no. 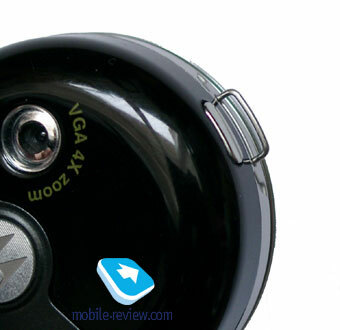 Motorola v80 will be released on the market this spring, its price will range from 500 to 600 dollars. The price will not change during the life cycle; only small and minor changes are expected. The phone will never become a mass one, since it is targeted for limited group of people who need to define their status with such product. In my opinion the phone turned out a successful one, it combines functionality with image, and will fit a lot of people. Motorola v500 was replaced by Motorola v80 really unnoticeably, and became my main phone (in addition to smartphone). 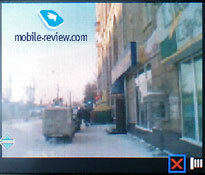 The reaction for Motorola v80 in Moscow (in cafes, restraints, public places) was very curious. People were asking what’s the name of this model, before seeing how it is opened or acts when there’s an incoming call around (color pouring). But when I opened the phone, or it started ringing the attention was guaranteed. I was receiving questions from those who were brave enough to ask. 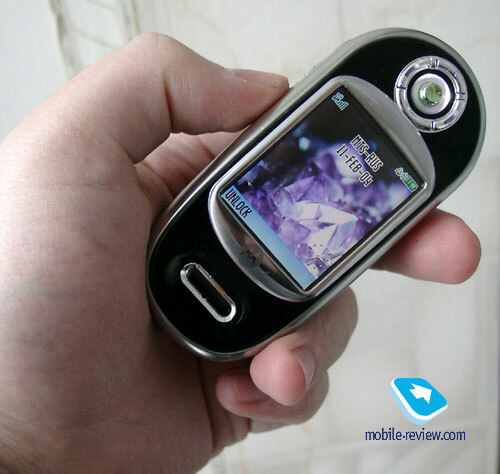 I’d like to repeat my thought again: Motorola v80 is pure image, which is not disgraceful to carry in your hands, and to show your friends. The phone is targeted on both, men and women - there aren’t any certain differences in this model. In my opinion the sales will split in half, with a slight preponderance for men. Thanks to its form-factor, interesting edging the phone doesn’t have any competitors around; its clearly unique, which is very odd for mobile phone market. There are two-three models that can be called unique.